Al Sharqia is in Northern Egypt. The capital city is the lovely sounding Zagazig which is at the heart of the cotton and grain trade. Zagazig is also home to the largest Islamic university in the world. Alexandria is on the Mediterranean coast. The capital is the city of Alexandria and is renowned as having one of the most important harbours in the country. It is also the location of the underwater site of Cleopatra’s Palace. Aswan is in Upper Egypt, famed for its dam on the Nile. It is also renowned for the ancient site of Abu Simbel. Aswan is the capital city with many modern facilities and luxury hotels. It is famed as the setting for Agatha Christie’s Death on the Nile. Asyut is a governorate that stretches along the banks of the River Nile for around 120 km. The capital city is also called Asyut which is modern. The ancient city of the same name is close by and dates from 3100BC. Beheira is a coastal governorate and is located on the Nile Delta. The capital city is Damanhur which was known as Hermopolis in Greek and Roman times, and had connections with Hermes and Apollo. Damanhur has a hot climate with winds blowing in off the desert. It does see rain in winter. Beni Suef is in Central Egypt and south of Cairo, on the west bank of the River Nile. The capital city is also named Beni Suef, where the Meidum Pyramid is located. It is also known for the elaborate large mansions in town. Cairo is the most populated governorate and also includes the capital of Egypt, Cairo. In Cairo there are world famous museums, theatres, fine restaurants and many luxury hotels. This is a historic city and also houses much of the diplomatic offices for overseas governments. The seat of the governing party in Egypt is located in Cairo. Dakhalia lies north east of Cairo. The capital city is Mansoura which means victorious in Arabic. Damietta is in North Eastern Egypt and is famous for guava farms and palm trees. Damietta is the name of the capital city and is full of history. Another famous place in this governorate is Ras El Bar, a city located where the Nile meets the Mediterranean. 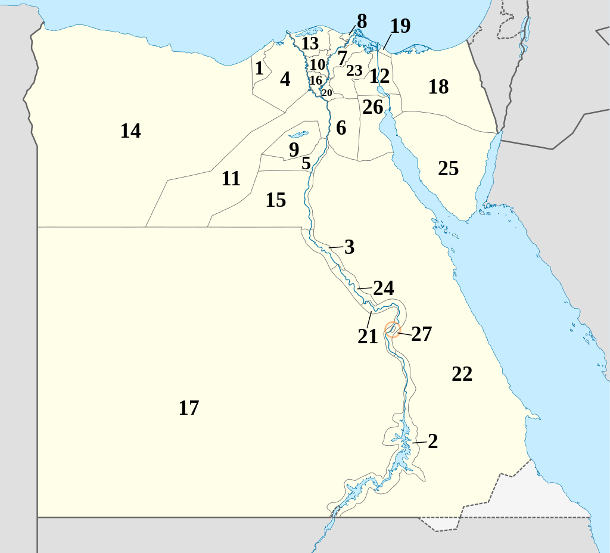 Faiyum is located in middle Egypt and south of Cairo. The capital city is Faiyum which occupies the ancient site of Crocodilopolis. This is one of the oldest cities in Africa at 4000 years old. Gharbia is located in Northern Egypt and is around 100km from Cairo. The capital city is Tanta which is a rail hub for the Nile and is also renowned for the cotton industry. Tanta is the place to come to for sweets, especially those eaten during festivals. Giza is world famous as home to the Pyramids and Great Sphinx, the iconic landmarks of Egypt. The capital is Giza City which is now part of the Greater Cairo metropolis. There are a number of excellent hotels in this area which is popular with visitors to the country. Ismailia is a governorate in North Eastern Egypt. The city of Ismailia is the capital and is located on the west bank of the Suez Canal. Its name means, “The city of beauty and enchantment,” and it is known for its historic buildings. Kafr el-Sheikh is located along the western part of the Nile Delta and on the Mediterranean coast. The capital city is also called Kafr el-Sheikh and is heavily linked to manufacturing. Luxor is in Upper Egypt and is a small governorate. It is the location of many famous ancient sites and is popular with visitors. There are many luxury cruise lines and hotels located here as well as the Valley of the Kings. Luxor is the capital and the site of the ancient city of Thebes, and has many shops, restaurants and hotels. Matrouh is in the Libyan Desert and is famed for the ancient site of the shrine of Ammon. It is also known for the battle site of El Alamein. The capital city is Mersa Matrouh, a Mediterranean seaport that has been in existence since Alexander the Great. Minya is a governorate in Upper Egypt renowned for the many ancient archaeological sites. These include the Fraser Tombs, Sharuna and Dehnet. The capital city is Minya which means, “Bride of Upper Egypt,” as it lies between regions. The location on the River Nile is a beautiful setting, and there are several elaborate buildings in town. Monoufia is another governorate in the northern part of Egypt, on the Nile Delta. Shibin Al Kawm is the capital of this area and is known for industry and agriculture. New Valley is located in part of the Libyan Desert and lies between Sudan, Libya and Egypt. It is one of the biggest regions in Africa. The capital is Kharga Oasis which is renowned for its acacia trees and vegetation. North Sinai is in the Eastern part of Egypt and part of the desert area but still on the coast. The capital city is Arish which is renowned for its marina and luxury hotels. Port Said is home to the Suez Canal and is located on the coast in North Eastern Egypt. The capital city is Port Said which is renowned for its waterfront, travel heritage, and old buildings with beautiful balconies. Qalyubia is in Lower Egypt and north of Cairo. It is renowned for agriculture and these days is part of the Greater Cairo metropolis. Banha is the capital and the name means, “Sweet like honey.” The city is also part of an ancient settlement called Arthribis. Qena is a governorate in Southern Egypt along the Nile Valley. It is also where several ancient sites are located such as Tukh, Abu Tesht, Esna, and Shanhur. The capital city is also named Qena which was once known as Cainepolis. This city is renowned for its Islamic cultural heritage. Red Sea is located between the Nile and the Red Sea itself. It is renowned for water sports including scuba diving and many resorts have developed here. Marsa Alam and Hurghada are just two of the resorts with good hotels and beaches. Hurghada is the capital city of this area and has a number of luxury resorts. Sohag is in Southern Egypt and includes part of the Nile Valley. The city of Sohag is the capital and has beautiful mosques, as well as being known for its agriculture. South Sinai is a governorate jutting out as a peninsula in the Red Sea. It is famed for the Sinai Desert, St Catherine’s Monastery and Mount Sinai, where Moses delivered the Ten Commandments. Towns along the coast include Nuweiba, Sharm-El-Sheikh and Dahab which have good hotels and are renowned as scuba diving centres. Suez is in North Eastern Egypt and synonymous with the Suez Canal. Suez is the capital city with three harbours. This is a major transportation hub in this part of the world. 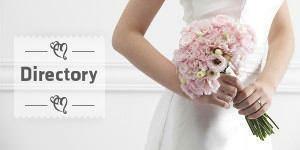 Find out more about getting married in Eqypt in our Egyptian Wedding Guide or browse our Egyptian Wedding Directory to start planning your dream wedding.